The holidays are fast approaching, and that means lots of families will be heading to airports with their kids. Adults forced to hang out in airports can visit bars, tour shops or treat themselves to a nice meal, but I thought this would be a good time to share some tips I worked up last year for Travel + Leisure about giving kids something to do at the airport beyond crying, whining and getting underfoot at the gates. Airport or a theme park? An arcade, a 3,000-gallon aquarium in the Main Terminal food court, a fun fountain and photo-op ready statues of Mickey Mouse, Snow White and other celebrity characters make Orlando International feel more like a theme park than an airport. Shops for the Kennedy Space Center, Disney, SeaWorld and Universal Orlando offer one last chance for must-have souvenirs. And the top floor of the parking garage is a great spot to watch the area’s nightly theme park fireworks – for free. Pittsburgh International Airport entertains children with its freshly refurbished Kidsport area filled with interactive displays, an exhibit honoring the Steel City’s own Fred Rogers and his “Mister Rogers’ Neighborhood” TV show and a giant Tyrannosaurus rex skeleton. PIT is also home to an art installation billed as the “World’s only in-airport robot repair shop,” and a giant transformer-like robotic figure inspired by the city’s bridges. At Chicago’s O’Hare International Airport, the ever-popular “Kids on the Fly” play area in Terminal 2 lets little ones climb on airport-themed toys while, in Terminal 1, a four-story tall, 72-foot long skeleton model of abrachiosaurus looks down from its spot outside the Field Museum. Kids get exercise and entertainment walking along the 744-foot-long kinetic neon light sculpture in the Terminal 1 underground walkway and a reason to look up “sustainability” after visiting the 26 soil-free plant towers in O’Hare’s aeroponic garden. Teams of adorable, stress-busting therapy dogs wearing “Pet Me!” vests regularly make the rounds at dozens of U.S. airports and the specially-trained pups (and, at SFO, a token pig) are happy to get hugs and kisses from kids. The pooches will patiently pose for photos and their handlers usually have souvenir trading cards to give out featuring head shots and stats (i.e. age, breed and favorite treats) for each animal. An airport or a museum? 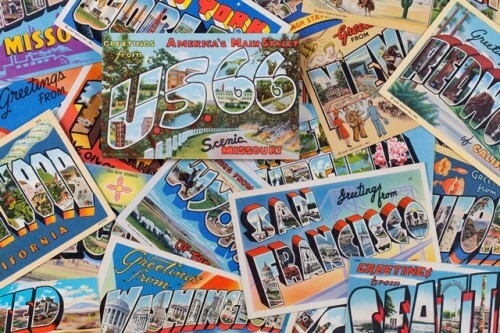 Many airports stage family-friendly art and history exhibitions year-round. Check your airport’s website for what’s on view when you’re traveling. Sometimes the best part of hanging out with kids at the airport is the great show put on by the airplanes and the bustle of activity out on the airfield. Watch from a window seat in a gate area or food court, or head for an airport observation deck. 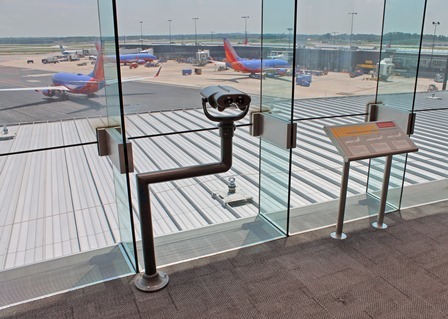 Baltimore-Washington International Airport has a large pre-security viewing gallery (with exhibits and a snack bar) and there’s a small post-security viewing deck at the entrance to Terminal 2 in Minneapolis-St. Paul International Airport. Got some ‘kids at the airport’ tips to share? At Chicago’s O’Hare International Airport, a pop-up lounge just for kids (and their parents) is moving through the terminals. Called the “Fly with Butch O’Hare” lounge, it’s described as a place to relax, take selfies, re-charge cell phones and devices and to learn about the Fly with Butch O’Hare mobile game the airport developed in collaboration with DeVry University. First, who was Butch O’Hare? He’s the airport’s namesake, Edward “Butch” O’Hare – and this year marks the 75th anniversary of Butch O’Hare’s heroic actions in World War II, saving the aircraft carrier Lexington. He was honored with the Navy’s first Medal of Honor, and in 1949 Chicago’s airport, Orchard Field was renamed Chicago O’Hare in his honor. The lounge is outfitted with chairs and foot stools, cell phone charging stations, the airport code in 8 – f00t-tall letters, orange flooring and a miniature plane flying overhead with – you guessed it – Butch O’Hare. There’s also an almost life-size cut-out of O’Hare and a plane – for selfies. ORD is also giving out flat photos of Butch O’Hare (on a stick) in the lounge and at bins in the domestic terminals and encouraging passengers to pose with the flat Butch O’Hare while in the airport or and around the world and post their photos online with the hashtag #FlyWithButchOHare. Looking for the lounge? It’s in Terminal 1, near Gate B12 through August 9 and then moving to Terminal 2, near Gate E1, from August 10 through 31. And what about that Butch O’Hare game? Updates on the progress of that project is on this Fly with Butch O’Hare page along with some airport trivia and a list of airport shops and restaurants offering discounts. Air travel can be stressful for even the most experienced road warriors. But it can be much tougher for families with a child on the autism spectrum who becomes unnerved by the lines and security procedures at the airport and the tight quarters and strange noises on an airplane. For the Littlejohn family it was dreadful. In 2010, they had plane tickets to fly from Boston to Orlando for a vacation at Walt Disney World. “My son Henry, then 6, has autism but had traveled well before. This time he was very anxious on the way to the airport. And by the time we got on the plane he was melting down; kicking and screaming,” said Susie Littlejohn. Before the plane could take off, they had to make a decision: Her husband ended up going on to Orlando with their older son, Jack; Henry and his mom got off the plane and went home. Littlejohn thought the air travel process might go smoother if children like Henry had a way to practice going to and through the airport and getting onto the airplane. She mentioned that idea to Jennifer Robtoy, the director of Autism Services at the Charles River Center in Needham, Mass, and Robtoy got in touch with Massport, which operates Boston Logan airport, to see if something could be worked out. “Within an hour of sending an e-mail to Massport, I got a reply,” said Robtoy. And within six months Massport, TSA, the Charles River Center (which is a chapter of The Arc) and several airlines (including JetBlue, United and Delta Air Lines) had created Wings for Autism, now a regular event offering families with children on the autism spectrum a chance to go to the airport and get on an airplane during a low-stress, dry run. “A lot of families aren’t sure if air travel is a possibility for them if they have a child with autism. But during this event they simulate everything as if you’re traveling,” said Littlejohn, whose family has attended all but one of the Wings for Autism events Boston Logan has hosted. “You park, take the moving walkway from the garage, wait in line, show your ID, get boarding passes and make your way through security. Everyone has a boarding time and gets on a plane,” she said. During the event, the airplane engines are kept running so kids can feel – and hear – what that is like. The planes don’t actually leave the ground, but when it’s time for “takeoff” the cabin door is closed and safety announcements are made. During the “flight,” beverages are served and there’s a snack service. Kids are also invited to visit the pilots in the cockpit. “We’ve found that some kids have issues walking down the jetway or when it is time to step on the plane,” said Brad Martin, director of customer service at Boston Logan. For others it’s when they’re getting strapped into their seatbelts or going through the emergency drill with the flight attendants. Martin said Boston Logan’s Wings for Autism program not only helps kids and their families tackle some of air travel issues, it also teaches airport and airline employees, as well as TSA officers, about the challenges autism can place on traveling. “They learn what to look for and how to handle certain situations and it teaches them to be patient and to see how they can help,” he said. And that attitude can rub off on other travelers. “If other passengers see a staff member willing to give a hand when a child with autism is having a hard time at the airport, they may also be more accepting, aware and sympathetic,” said Littlejohn. Autism now affects one in 88 children nationwide. So while the Wings for Autism program is a big success at Boston Logan airport, families traveling with a child who has mild to severe autism would like to find sensitive and trained staff at all airports. The Autism Society of Minnesota participates in the Navigating Autism program at Minneapolis-St. Paul International Airport and, thanks to a grant from Autism Speaks, The Arc has licensed the Wings for Autism program and will take it nationwide to more than 50 airports within the next three to five years. Wings for Autism events are currently planned at the Detroit and Baltimore airports. JetBlue is hosting a program at the Burbank Bob Hope Airport in California on May 4 and another one at New York’s JFK International Airport this fall. And what about Henry Littlejohn, the 6-year-old whose meltdown inspired the Wings for Autism program in the first place? Now eight, he was able to get on the plane during the event held at Boston Logan Airport earlier this month.